Home » Holiday » HOLY HORSERADISH! Doesn’t everyone buy too much horseradish for Pesach.? It so doesn’t matter if you’ve opened just one jar of the ready made stuff or lug home one big honking hunk of root on the Seder plate, there’s always leftovers. You can, of course, dump the unused portion in the closest garbage receptacle OR, if you’re like me, you can utilize it in a bunch of different recipes that can take ho hum Pesach fare and turn it into to fantastic food that just happens to be Pesach friendly. To keep the heat in your fresh horseradish keep it stored in the refrigerator. Horseradish loses its pungency very shortly after it’s ground and as it’s cooked so grind it just before you need it and add it to the end of the cooking process. For me, I say, grinding horseradish is much like chopping onions, the fumes can be overpowering. If you use a food processor, turn your head away as you remove the top after processing. The ready made stuff comes in the red (colored with beet juice) or white varieties and can run the gamut from sweet to lightening hot. The prepared processed stuff usually has vinegar as part of the ingredients. Vinegar stops the chemical reaction that releases the heat and stabilizes the heat and flavor levels. The amount of heat is determined when the vinegar is added to the freshly ground horseradish. To keep the flavor mild add the vinegar immediately. 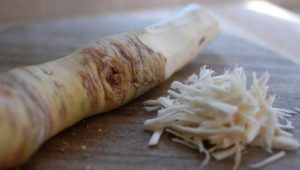 Fresh horseradish root is available year-round but prime time is spring, just in time for Seders. Look for roots that are firm, and don’t have mold or soft or green spots. Avoid roots that look shriveled and dry or have begun to sprout. Use a vegetable peeler to remove the outer layer before grating. You can grate it by hand or in a food processor or blender (I always add a little water to the blender or food processor to help with the consistency). A good rule of thumb is to add 2 to 3 tablespoons of white vinegar and 1/2 teaspoon of salt for each cup of grated horseradish. If you are looking for a mild horseradish add the vinegar immediately. If you’re looking for a kick in the kisser kind of flavor wait 3 or 4 minutes before adding the vinegar. The following recipes are all Passover friendly but are so good they can be used year around. 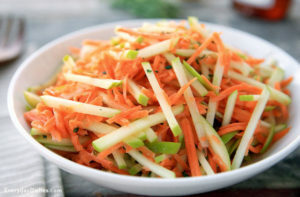 In a large bowl combine the cabbage, carrots and apple. In another bowl combine the sour cream (or mayonnaise), horseradish, sugar, salt and pepper and mix until blended. 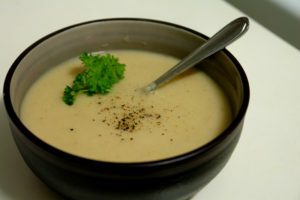 Pour the mayonnaise or sour cream mixture over cabbage and apple mixture and mix to coat. Cover and chill for at least for an hour. Serves 6 to 8. To keep the flavor mild add the vinegar is added immediately.